The client for this project, Ibrahim Hassan Al Asmakh is the founder/owner (President & Chairman) of Regency Group Holding - the leading business group in Qatar including Real Estate, Travel and Tourism, Hotels and Hospitality, Construction, Transportation, Insurance, Technology, Logistics and Medical Services. 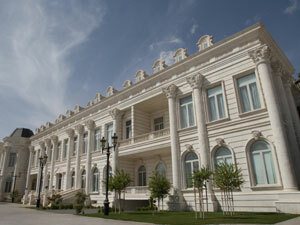 The client built this palace to be his personal residence. Arabesque was awarded the contract following a complex tender / bidding process. Various GRC subcontractors were invited to submit their best quotation to the Main Contractor (Ramco Trading & Contracting). The bidding process was a complicated procedure where subcontractors needed to be pre-qualified by the client and consultant prior to award of the contract. GRCA Member Arabesque secured the contract for the supply of the GRC to the palace based on a number of palace projects that Arabesque has successfully completed in the past. Arabesque has also completed projects for the main contractor, Ramco Trading & Contracting, in the past and were assessed as a suitable supplier for this new palace project. 1. decorative fluted columns with base and capital profile of various sizes showcasing Mediterranean & Roman Empire designs. Another unique and distinctive feature of the GRC supplied to this project was the acid wash finish and the concealed fixing system for the GRC using stainless steel materials. 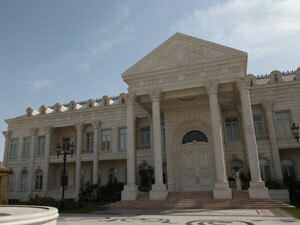 This is the first private palace in Qatar to use this type of finish. The whole structural /architectural project took more than 3 years to complete. The GRC manufacturing works were only allowed to start once the site was ready and full site measurements needed to be taken prior to commencement of production and site installation. 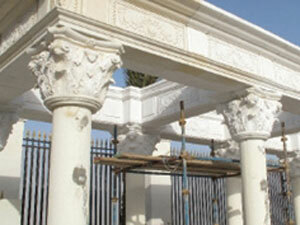 The GRC production time is usually quick due to Arabesque's expertise and highly skilled workforce. 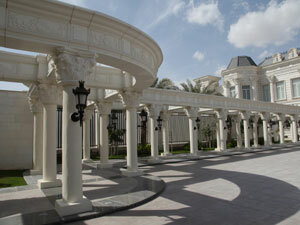 The total weight of GRC product used on the palace project was 305 tonne. The GRC cladding panels were produced by the sprayed manufacturing method, whilst the balustrade and corbel units were produced by the poured premix manufacturing method with vibration compaction. The finish on the GRC was an acid washed, sand beige pigmented, finish.